I took a dog life vest that was a little too small and cut the inside and took out some foam. Then I covered it with velvet material from an old pair of pants. I bought a spider decoration and cut off legs and sewed on to the sides of the vest. 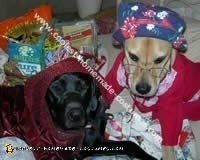 I then took two light decorations and cut in half and glued on to a pair of doggles that he would not wear anymore. 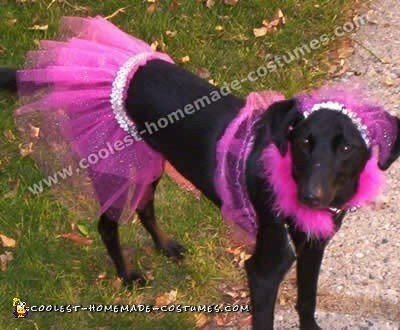 This was so easy to make and hope that it can help others with their dog Halloween costumes! We thought long and hard for the majority of the year about what to dress Mickey up as for Halloween this year and we finally decided that he would make an excellent Big Bad Wolf. We used a pattern for a little girl’s nightgown with Mickey’s dimensions to make a perfect fit for him. The materials that we used for the gown were a soft red material and lace. We found the hat at the bottom of my daughter’s closet. To securely keep the hat and glasses in place we took the blue elastic band that came with an underwater camera and measured the length from the bottom of both of his hears under his chin and cut the band to those specifications. We hot glued each end of the band on the inside of opposite ends of his hat and then hot glued a pair of old glasses to the elastic band inside the hat as well. We used a handmade quilt that my Great-Grandma left us for the added Grandma’s bed touch. All together this costume took us about four hours to make. 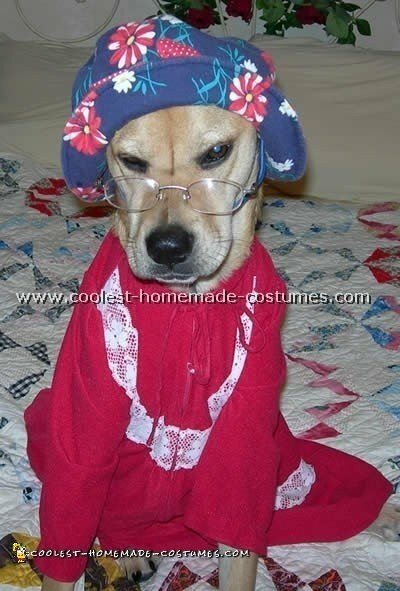 We think this is a very original costume because we have searched hundreds of dog Halloween costumes and have yet to find a Big Bad Wolf costume. I started by sewing candy and pumpkin buttons on a button up sweater. It also had a scarf attached to the collar. The overalls had patches on the knees and a felt pumpkin on the pocket on her back. I made a cone hat and put patches on it as well. I finished the costume by placing hay on the end on the sleeves and on the collar of the sweater. 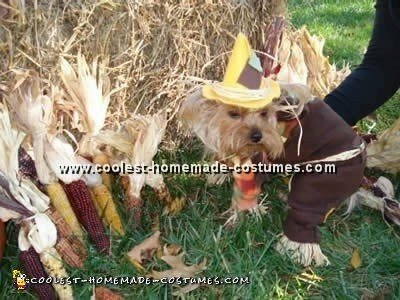 Enjoy creating your dog Halloween costumes! 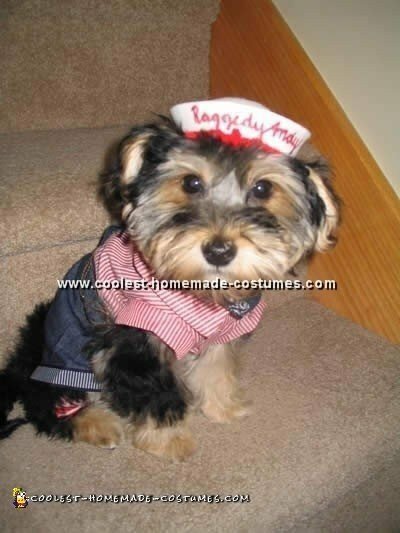 I grew up surrounded by Raggedy Ann & Andy dolls and toys so dressing my new puppy as Raggedy Andy was a no-brainer. 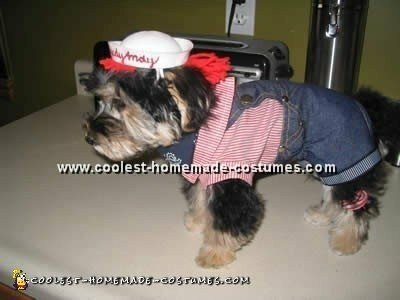 My only concern was creating dog Halloween costumes as I have no sewing skills whatsoever! 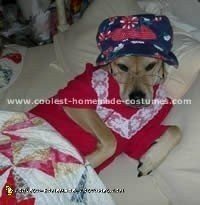 The outfit itself is a little shirt and overall combo which is actually just an everyday dog outfit and is paired with a navy bandana knotted on his back. He’s also wearing newborn baby red/white striped socks with the foot area cut off. Atop his head I used a key ring and tied strings of yarn around it. I sewed the key ring hairpiece inside a white felt doll hat. I used a variety of markers and pens to make the "Raggedy Andy" on his hat. The costume turned out adorable and really wasn’t one of those dog Halloween costumes that’s such a challenge after all. This is my Great Dane, named Mattie. 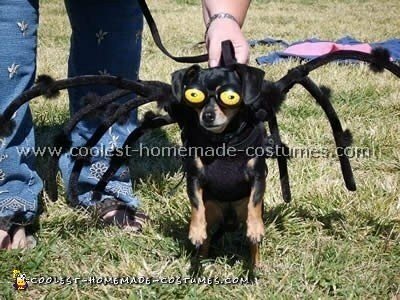 Those of you with big dogs know that dog Halloween costumes are unheard of for large dogs. My grandma helps me every year to put my ideas from paper drawings to the sewing machine. 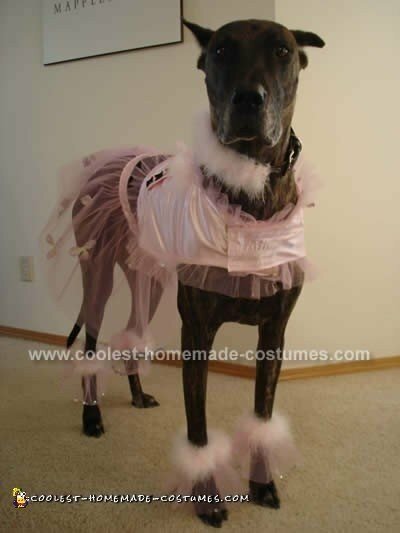 Mattie is a 120 pound Great Dane and we created a Miss Great Dane/Pink Princess costume. This costume included a top skirt, shiny boots and collar and cover all made from scratch. The idea came from the fact that I love pink and everything available right now is for itty bitty dogs and their pink jackets boots and dresses. I thought, why not come up with something my big Mattie could wear and be part of the little dog crowd. Mattie thinks she is little and has a Yorkie for a best friend. 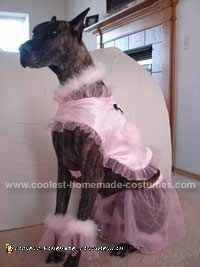 Material used was a pink silk for the top, outlined in tulle and sequins and kept on her underside with Velcro. The skirt is an elastic waste made from a light pink tulle with double layers to hold more silver sequins and then small flowers were sewn in under the tulle. The booties are elastic with sewn feather boa over the top of doubled tulle to hold more silver sequins. The collar is sewn over just a black collar to match and tie the rest of the Miss Dane costume together. 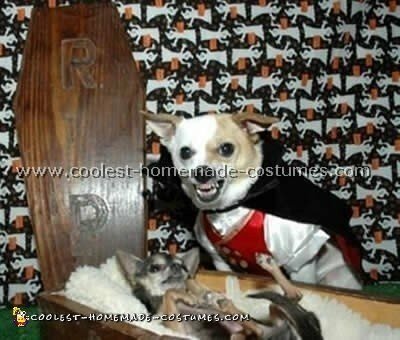 Tips: This is one of those dog Halloween costumes that’s very easy and inexpensive to make. For a large dog, a pattern is best taken off of a large t-shirt to get the top made and know how much room to Velcro so it stays on the back/top of the dog. The skirt is easy by measuring the belly of the dog so it’s not too tight. This took about one week to make once the design was in place. I hope everyone has a wonderful Halloween! Happy pet costume making! For this princess costume, I bought elastic with silver sequins. The bottom elastic was 2-inch thickness and the top was 1-inch thick elastic. I also purchased about a yard of pink mesh material. I measured her chest and her hips; then sowed the elastic to the mesh for the bottom skirt. For the top I made a tube-top and added a sequins strap around the neck like a halter-top. The crown was just a string of elastic sewed in a circle with mesh sewed to it. This princess costume is very simple and cute.